One of the best things about baking is that there are so many ways to make the same things: cookies can be crunchy or chewy, muffins can be dense or light, and brownies can be cakey or fudgy. The thing is everyone is usually in one camp or the other. For me, cookies must be chewy and brownies must be fudgy, but when it comes to muffins, I love both kinds as long as they’re not tough. 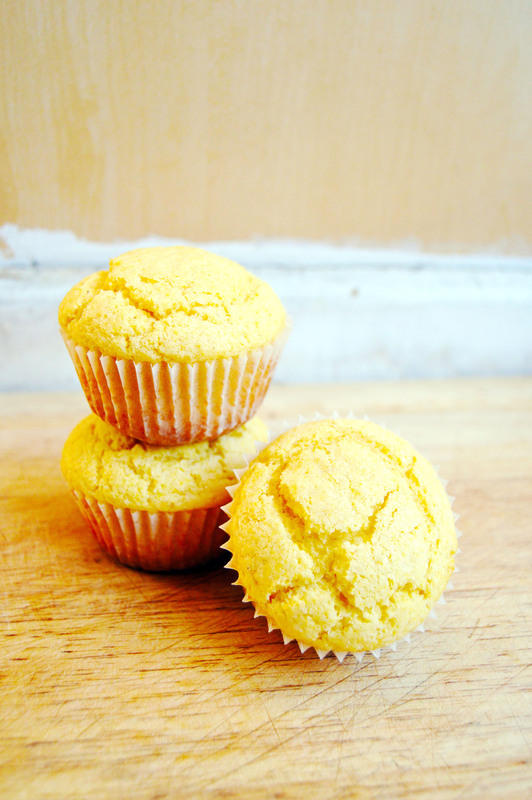 A few days ago, I was really craving corn muffins. (Not corn bread, which I think is a different breed.) The last time I had corn muffins was on my trip to Atlanta. We stopped by a Cracker Barrel as a rest stop and had a satisfying meal… satisfying except for the corn muffins. (I call it corn muffin because it was not square but baked in a muffin pan.) Ick! What is that stuff? As I bit into the corn muffin, disappointment filled my mouth in the form of salty, bland and coarse morsels. I need my corn muffins to be sweet and corny. I set out to make my own recipe. When freshly baked, it has a crisp exterior and a light and sweet interior. I wish I had some corn kernels to add to it, but I did not at the moment. I would encourage it if you have some on hand. 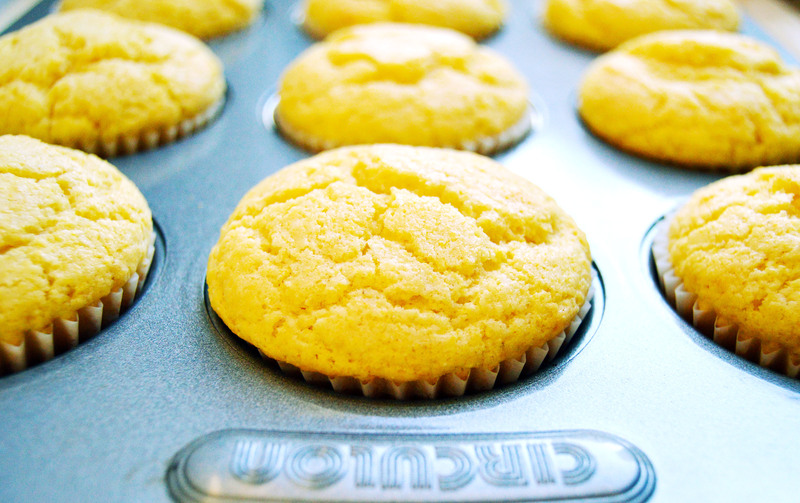 Preheat oven to 350 ˚F and line a muffin pan with paper liners. In a mixing bowl, mix flour, cornmeal, sugar, baking powder, and salt. In a separate bowl, mix milk, butter, oil and egg. Mix milk mixture into the flour mixture and fold batter until just combined. Scoop batter evenly into the paper lined muffin pan and bake about 13-18 minutes or until tester comes out clean. This entry was posted in Bread, Muffins, Simple Sundays and tagged bread, Corn, corn muffin, muffin, quick bread. Bookmark the permalink. You should be a hand model! 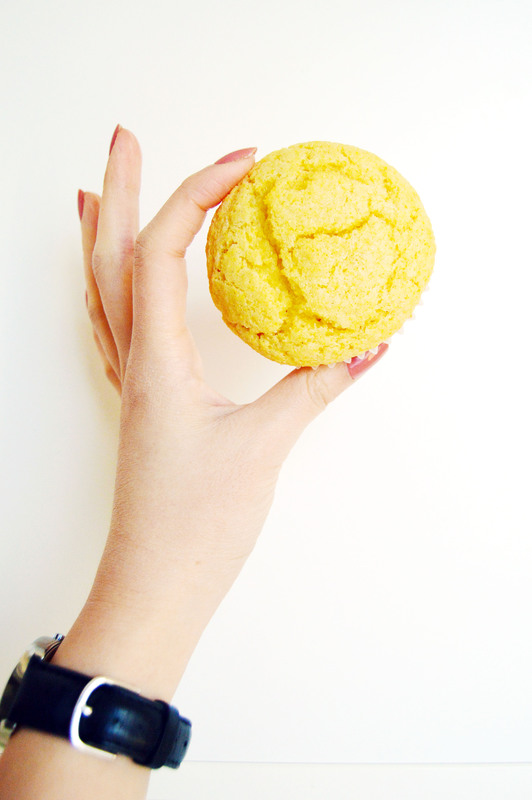 Beautiful corn muffins!